Nothing evokes the spirit of Carnival in Trinidad and Tobago more than the twin island nation's home-grown instrument, the steelpan. Pan-lovers anticipate Carnival' s steelpan competition, Panorama, as fervently as soccer fanatics await the World Cup, and the rivalry is just as fierce, with 14 of Trinidad's and Tobago's top steel orchestras - each numbering nearly 100 members - vying for the title of Panorama champs. 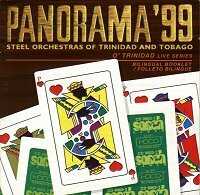 Panorama '99 - Steel Orchestras of Trinidad and Tobago, a double-CD set, was recorded live in Port of Spain, Trinidad, during the final stages of this year's Panorama competition. Sanch Records' Managing Director Simeon L. Sandiford's meticulous recording techniques capture Panorama's stunning musical results, and the sophisticated subtleties of steel orchestras without the delays or distortions that abound during the marathon presentation. In the CD's accompanying booklet, Sandiford fastidiously explains his recording process, designating his role as that of a third umpire in cricket and including his own criteria for judging steel orchestras. Panorama song selections are culled from popular calypsos or tunes written specifically for Panorama during the Carnival season and expanded into ten-minute renditions; selections featured hem include venerable calypsonian Lord Kitchener's popular 'Toco Band', performed by three different bands, including 1998 champs the Nutones Steel Orchestra; American pianist and first-time Panorama arranger Andy Narell's jazz-flavoured 'Coffee Street performed by the Hydro Agri Skiffle Bunch; Soca superstar Machel Montano's spirited 'Showdown, interpreted by Pamberi Steel Orchestra; and Calypsonian Oba Synette's 'In My House' in a performance by 1999 champs Witco Desperados, which earned gifted arranger Clive Bradley his second consecutive Panorama victory. However, the biggest stars of Panorama 1999 are the schoolchildren, single mothers, office workers and Trinidadians from all walks of life who comprise these steel bands, forfeiting most Carnival festivities to diligently perfect their pan-playing and elevate Panorama to the heights of symphonic synchronization. For the past several years Sanch Electronix has performed yeoman service in the steelband community, faithfully recording the performances of steel orchestras around and during the Panorama competition. Sanch is the reason, for instance, that masterful arrangements like Jit Samaroo's Pan in A Minor have become classics over the years. In the absence of such a project, many of these arrangements would never be heard again. As anybody who has experienced first-hand the circumstances under which bands rehearse and perform will appreciate, this is no mean task.